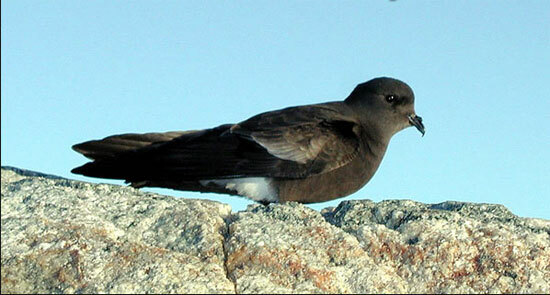 Wilson's Storm-Petrel: Small storm-petrel, mostly brown-black body, pale brown wing bands, large, conspicuous white rump. Wings are short and rounded. Feet extend past tail in flight. Smallest and most commonly seen storm-petrel off the Atlantic Coast. Direct flight with steady, shallow wing beats. Wilson's Storm-Petrel: Breeds on rocky islands in Antarctic and sub-Antarctic seas; in non-breeding season ranges northward over Atlantic, Pacific, and Indian oceans; in eastern Pacific very rarely north to Monterey Bay. 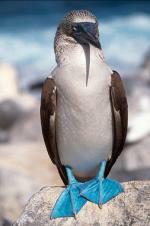 Pelagic, comes ashore only to breed. Wilson's Storm-petrels have one of the longest migrations known, and travel in a figure eight each year from breeding grounds in the Antarctic to the subarctic feeding grounds and back again. They are difficult birds for most people to see because they spend all their lives at sea when not breeding, and even during the breeding season they only come to land after dark and leave again before dawn. They have yellow webbing between their toes. Modern field guides do not usually show this characteristic as it is not really a field mark being so rarely observed.